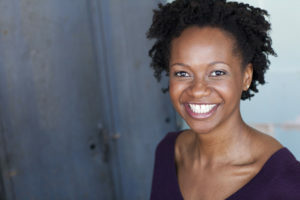 Eunice Woods is an actor and singer in Chicago. Credits include The Curious Incident of the Dog in the Night-Time (Steppenwolf Theater) Little Shop of Horrors (American Blues Theater), The Project(s) (American Theater Company), Sparky! (Lifeline Theatre), The Revel (The House Theatre of Chicago), Dessa Rose (Bailiwick Chicago), Hey! Dancin'! Hey! Musical (The Factory Theater), The True History...of Julia Pastrana (Tympanic Theatre Company), Raskol (Vintage Theater Collective), and The Rose Parade (Body Project Ensemble & VOTC). Eunice is a proud company member of Barrel of Monkeys where she performs and teaches in Chicago Public Schools. She holds a BFA in Theatre Arts from Boston University and is represented by Gray Talent Group. Eunice says: Working with Rebeca has reconnected me with my voice and given me access parts of my range I thought were unavailable. She has helped me break through self-doubt and anxiety about singing -- essentially forcing me to get out of my own way to embrace my natural, unique sound. I have a newfound command of my instrument because of the solid technical foundation I've built with Rebecca!